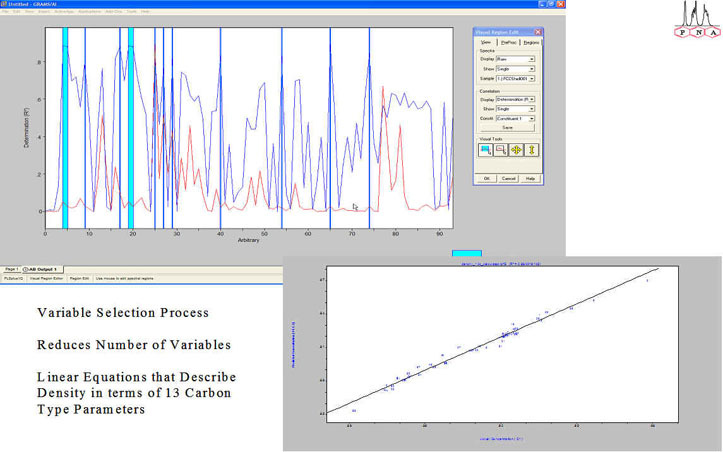 Proposition: Detailed hydrocarbon analysis for kinetic model development. Our experience is that an improved and useful analysis can be obtained from NMR analysis. There are several ways to approach the NMR analysis and the chemometric approach to correlating NMR data to physico-chemical parameters of use to process control. RCC Feedstream Analysis by 1H and 13C NMR: Multivariate Prediction of Chemical and Physical Properties. 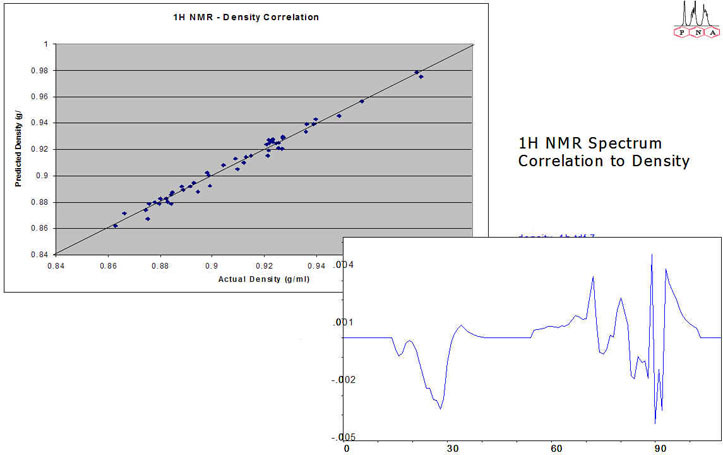 1) 60MHz process NMR data available from online NMR unit. 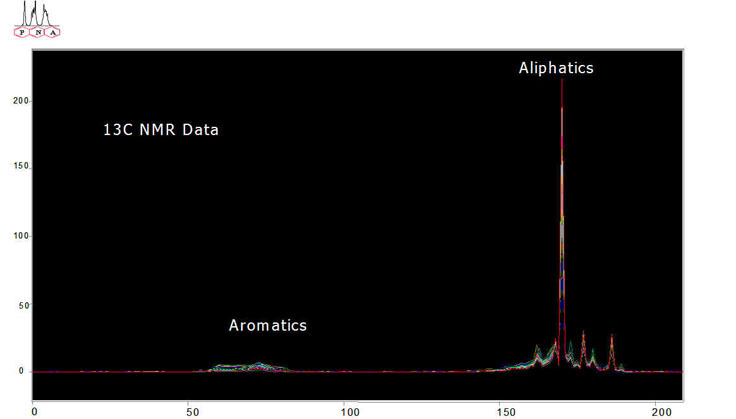 2) 300MHz 1H NMR data available from standard NMR expirements on laboratory NMR system at Process NMR Associates. 3) Expansions of 1H NMR data on RCC Feeds. 4) Calculated 1H NMR Parameters represented as an alternative “spectrum” for use in chemometric modeling and linear regression. 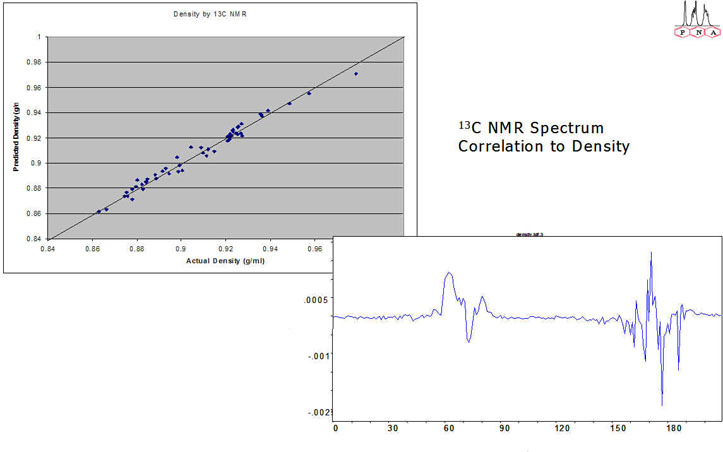 5) 13C NMR data obtained on RCC feeds. 6) Expansions of 13C NMR data. 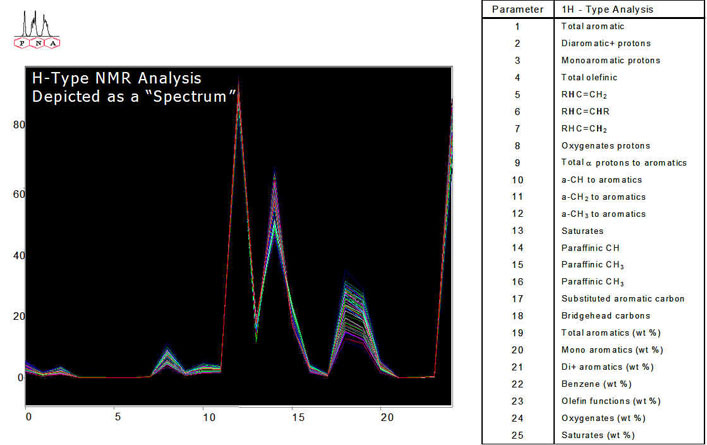 7) 13C NMR and avereage molecule parameters calculated from 13C spectrum. 8) Calculated 13C NMR Parameters represented as an alternative “spectrum” for use in chemometric modeling and linear regression. 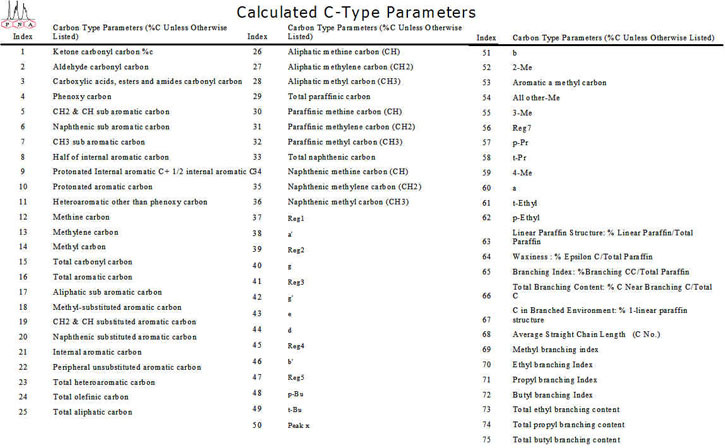 9) Correlations of spectra and calculated parameters to physico-chemical properties of RCC feeds. 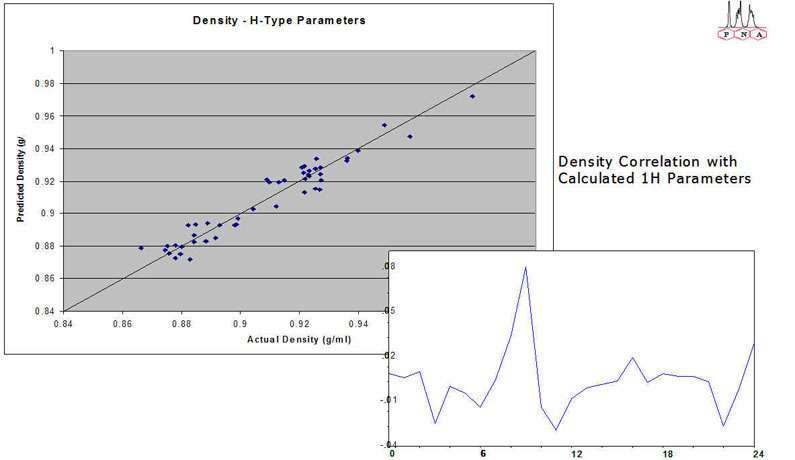 10) Correlation of spectra and calculated parameters to density. 11) Variable selection for linear correlation of calculated NMR Parameters to physico-chemical properties of RCC feeds. 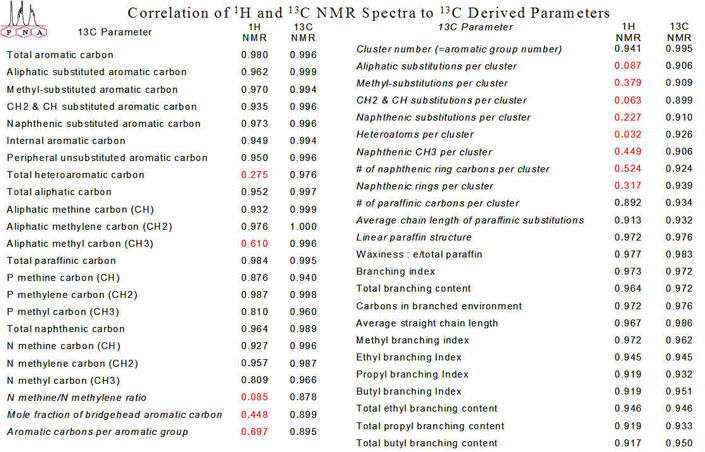 12) Correlation of Calculated 13C NMR Parameters (C-Type and Average Molecule) with both high resolution 1H and 13C NMR spectra. 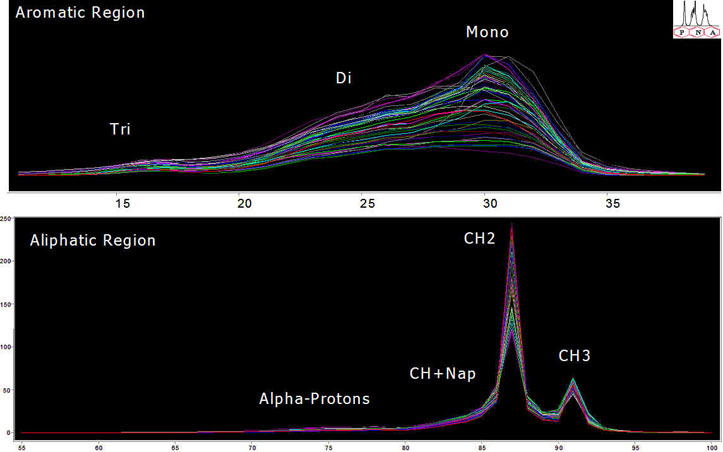 Models created can be utilized by personnel with no NMR experience to calculate NMR parameters directly from the spectrum without any prior knowledge of integrations or calculations to be performed. Chemical and Physical Properties of RCC Feedstreams can be determined by 1H NMR (at 60 and 300 MHz) and by 13C NMR H-Type and C-Type Parameters do not provide as good a correlation as is observed by full spectrum regression. This is due to loss of resolved chemical shift information when the spectrum is reduced to larger integral areas. 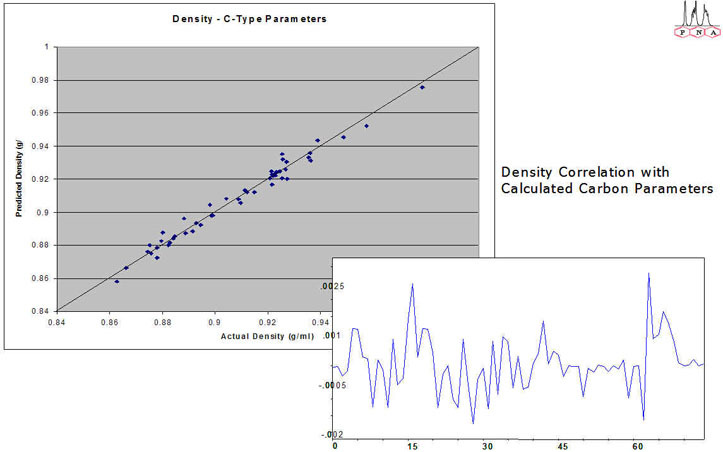 1H NMR can be combined with PLS regression modeling to provide detailed carbon type analysis for RCC Feeds Regression analysis of 13C NMR data can be utilized to fully automate the prediction of 13C NMR type analysis : reducing the necessity for considerable knowledge and analysis time on the part of the analyst.